Sports medicine uses hot and cold therapy to deal with injuries. The availability of hot or cold packs on the game field is minimal, but chemical packs can provide either hot or cold for an injury in moments. Hot packs take advantage of chemical reactions that produce heat as they progress. Many commercially available hot packs utilize common and safe chemicals to generate heat. One of the simplest chemical hot packs possible involves dissolving calcium chloride, also known as rock salt, into water. As the crystals of rock salt dissolve, they generate heat from the process of the calcium chloride dissolving into its collective ionic parts. The temperature of the hot pack can reach 90 degrees Celsius, so take care not to burn the skin. The hot pack will continue to provide heat for approximately 20 minutes. Magnesium sulfate is another chemical that liberates large amounts of heat when dissolved in water. The temperature of the hot pack and its lifetime is similar to the hot pack made using calcium chloride. In both cases, the hot pack contains a small pouch filled with water and the chemical salt in dry crystal form surrounds the pouch. When you break the pouch, the chemical salt begins to dissolve in the water and the reaction of the salt dissolving produces the heat required to treat the injury. A different mechanism of heat production forms the hot pack using sodium acetate. By neutralizing vinegar with baking soda, two common kitchen chemicals, the resulting solution contains sodium acetate and water. The neutralization is a violent reaction unless done very slowly. 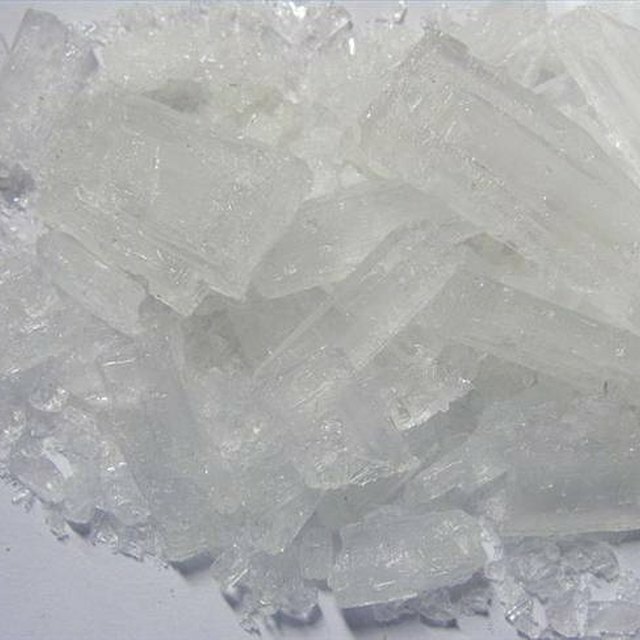 Evaporation of this solution until crystals just begin to form creates a super-cooled solution of sodium acetate. The sodium acetate remains in solution below its normal crystallization point. The only thing stopping the whole solution from crystallizing is a site for the crystals to begin forming. Cooling the solution and placing it in a plastic bag along with a piece of thin metal that is isolated from the solution forms the chemical hot pack. To initiate the reaction, break the barrier between the solution and the piece of metal and apply pressure to the piece of metal with your finger. As the metal flexes, small irregularities form on the surface of the metal and the sodium acetate begin to crystallize. The process of crystallization generates the heat. Lancaster, Angel. "Chemicals Used in Heat Packs." Sciencing, https://sciencing.com/chemicals-used-heat-packs-7441567.html. 27 April 2018.